John Pizzarelli - With A Little Luck from Concord Music Group on Vimeo. Paul McCartney had a great idea for an album. 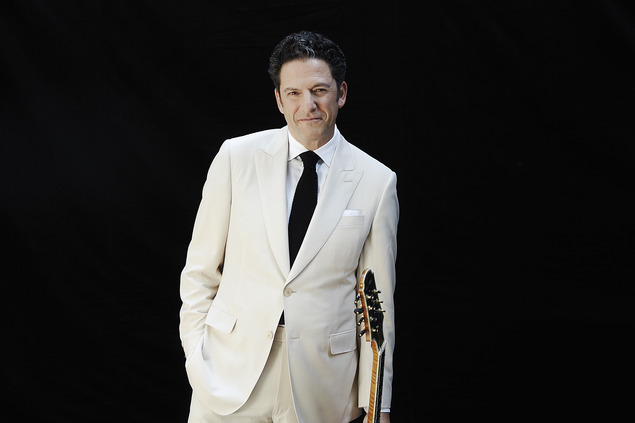 He just needed the world-renowned guitarist and singer John Pizzarelli to make it. “My Valentine” was the one McCartney composition on his album of songs from the '30s and '40s, Kisses on the Bottom (MPL/Hear Music/Concord). Pizzarelli played guitar on the album and backed Sir Paul on a handful of prestigious live performances, including the GRAMMY Awards, MusiCares Person of the Year gala and the initial iTunes/Apple TV live broadcast. Hailed as one of the prime contemporary interpreters of the Great American Songbook, Pizzarelli has expanded his repertoire by performing the music of Joni Mitchell, Neil Young, Tom Waits, Antônio Carlos Jobim and Lennon-McCartney. To say Pizzarelli was tickled is putting it mildly. Pizzarelli, his wife Jessica Molaskey – co-producer of Midnight McCartney - and pianist Larry Goldings immediately went into research mode, digging through McCartney's albums of the last 45-plus years to find songs that could be re-harmonized and adapted for Pizzarelli's trademark style. “I immediately found 'Warm and Beautiful' and 'Junk'; Larry Goldings brought in 'Waterfalls'; my wife found 'Heart of the Country',” Pizzarelli says. “We started to realize how brilliant these songs are. He's obviously a rock 'n' roller, but they were really easy to break down. 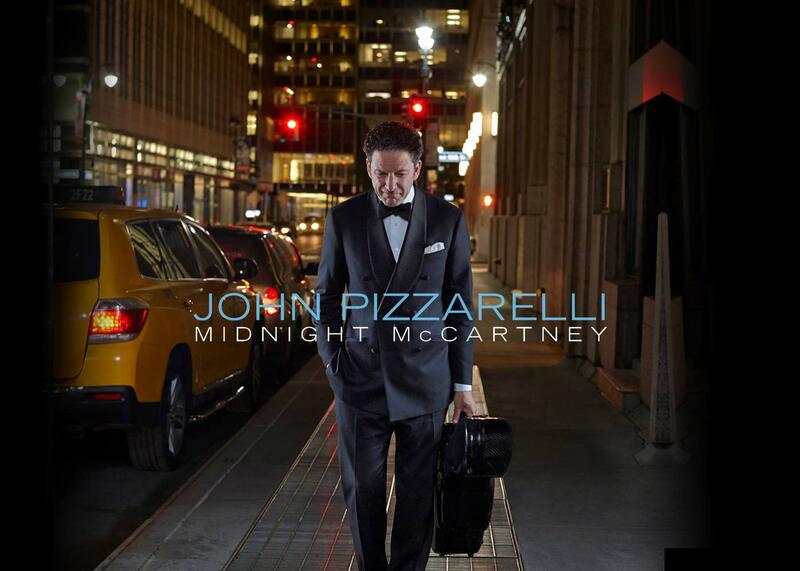 Concord Records will release Midnight McCartney, Pizzarelli's 11th album for the label, on September 11, 2015. The idea of Midnight McCartney was an easy one to warm to: A half-dozen of Pizzarelli's albums have been devoted to a single artist or style: Duke Ellington, Frank Sinatra, the Beatles, bossa nova. The title, too, captures the treatment of the songs. “It's like the Sinatra thing – Songs for Swingin' Lovers or Moonlight Sinatra – it gives people an idea to hang their hat on,” Pizzarelli says. The project started with Pizzarelli and Goldings making demo recordings of ballads – “My Love,” “Some People Never Know,” “Heart of the Country” and “Waterfalls” – and while Pizzarelli was touring, he would work on other songs, among them the up-tempo numbers. The intensity of the sessions, Pizzarelli says, was higher than for most recordings – every musician knew that Paul McCartney would be listening to their work. The Beatles broke up when Pizzarelli was nine years old, and his fascination with their albums lingered, particularly Abbey Road and Rubber Soul through his teen years, and their early work when he was in his 20s, which included playing the songs the Beatles covered in his own rock band in New York. Long a McCartney fan, Pizzarelli has kept up with his work over the decades, noting a strong affinity for his albums Tug of War and Pipes of Peace. Rather than record in New York City, they moved the operation to the Jacob Burns Film Center and Media Arts Lab in Pleasantville, N.Y.
And like most Pizzarelli records, it's a family affair: wife Jessica Molaskey co-produced the album and provides background vocals; John's father Bucky adds rhythm guitar on several tracks and a stunning solo on “Junk”; brother Martin is on bass throughout; and teenage daughter Madeline got into the act, transcribing “Warm and Beautiful” for her father to sing in a different key. Established as one of the prime contemporary interpreters of the Great American Songbook, Pizzarelli has expanded that repertoire by including the music of Joni Mitchell, Neil Young, Tom Waits, Antônio Carlos Jobim and Lennon-McCartney. His themed shows, often performed with his wife Jessica Molaskey, suggest there is no limit to Pizzarelli’s imagination or talent. “The ability to infuse pop and jazz with a Chekhovian wisdom about life’s ups and downs is the special gift of John Pizzarelli and Jessica Molaskey, long-married musical partners whose work gets deeper each year,” The New York Times raved about the show “Grownup Songs” at New York’s Café Carlyle. The next step is introducing the solo work of Paul McCartney to his audience through his September 11, 2015 release on Concord Records, Midnight McCartney, and on stages around the world. The challenge, Pizzarelli says, is lining up the lesser-known McCartney songs alongside the works of Gershwin, Berlin and Rodgers. 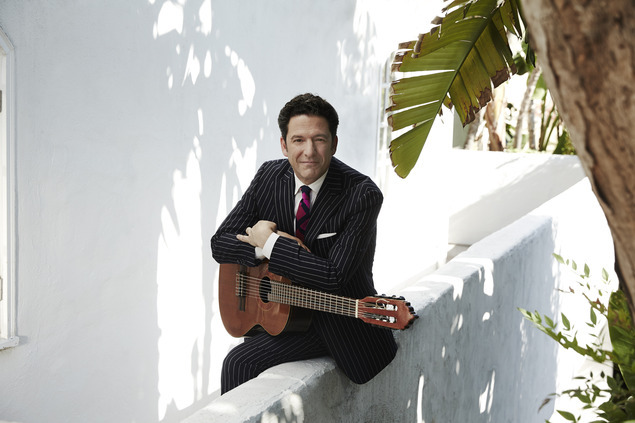 Pizzarelli started playing guitar at age six, following in the tradition of his father. He turned to jazz in his late teens after playing in rock bands, and he received an education playing with his father Bucky Pizzarelli and many jazz greats who would influence his work: Benny Goodman, Les Paul, Zoot Sims, Clark Terry and Slam Stewart, among others. His solo recording career started in 1990 with My Blue Heaven on Chesky Records. He played clubs and concert halls on the jazz circuit, opening for such greats as Dave Brubeck, Ramsey Lewis and Rosemary Clooney. In 1993, he was honored to open for Frank Sinatra’s international tour and then joined in the celebration for his 80th birthday at Carnegie Hall, bringing down the house singing “I Don’t Know Why I Love You Like I Do” with his father accompanying him. Pizzarelli’s hero and foundation over the last 25 years has been Nat “King” Cole, to whom he has devoted two albums, Dear Mr. Cole and P.S. Mr. Cole. Since 2013, Pizzarelli and pianist Ramsey Lewis have toured a Cole tribute show. After recording albums for RCA devoted to torch ballads (After Hours), classic swing and bold originals (Our Love Is Here to Stay), holiday songs (Let’s Share Christmas) and the Fab Four (John Pizzarelli Meets the Beatles), Pizzarelli signed with the GRAMMY® Award-winning label Telarc International, a division of Concord Music Group. His string of successful albums started in 2000 with Kisses In the Rain, a diverse set of standards and original tunes that showcase the spontaneity of his live performances within a studio setting, followed by Let There Be Love. In 2004, Pizzarelli introduced a new generation to the distinctive Latin rhythms of Bossa Nova. Produced by Russ Titelman, the acclaimed disc features several Brazilian musicians including drummer Paulo Braga, pianist César Camargo Mariano and vocalist Daniel Jobim. According to Billboard, “His performance throughout, as both vocalist and guitarist, is exceptional." Knowing You, Pizzarelli’s 2005 release, pays homage to the many talented musicians and songwriters he’s met throughout his career, among them Jimmy McHugh, Sammy Cahn, Alan and Marilyn Bergman, Johnny Mandel and Brian Wilson. The Associated Press called the disc “A classy, urbane session. The rich colors make this among the best of Pizzarelli's albums." In 2006, Telarc introduced Dear Mr. Sinatra, John’s tribute set to “Ol’ Blue Eyes,” featuring the Clayton-Hamilton Jazz Orchestra. The collection features John Clayton’s clever reworking of standards such as “I’ve Got You Under My Skin” and “You Make Me Feel So Young,” as well as songs written for Sinatra, “Ring-A-Ding-Ding!,” “Nice and Easy” and “The Last Dance.” The New York Times praised the recording for “exploding with enthusiasm and excitement." His 2008 recording, the GRAMMY® Award-nominated With a Song in My Heart, celebrates the music of composer Richard Rodgers and includes swinging Rodgers & Hart standards like “The Lady Is a Tramp,” “Mountain Greenery” and “Johnny One Note” and theater songs from South Pacific and The King and I. The singer-guitarist’s first-ever Duke Ellington recording, Rockin’ in Rhythm, was released in February 2010. For the dozen tracks, Pizzarelli took the tack of Ellington, noticeably displaying the strengths of the musicians in the band. In addition to a cut for solo guitar, four songs highlight the quartet (with pianist Larry Fuller, bassist Martin Pizzarelli and drummer Tony Tedesco) and seven include the Swing Seven horns with arrangements by Don Sebesky. Pizzarelli married songs from great pop songwriters of his own generation with traditional jazz arrangements and melodies. Double Exposure, released in 2012, united the Beatles and Lee Morgan, Tom Waits with Billy Strayhorn and the Allman Brothers Band with the style of Wes Montgomery. 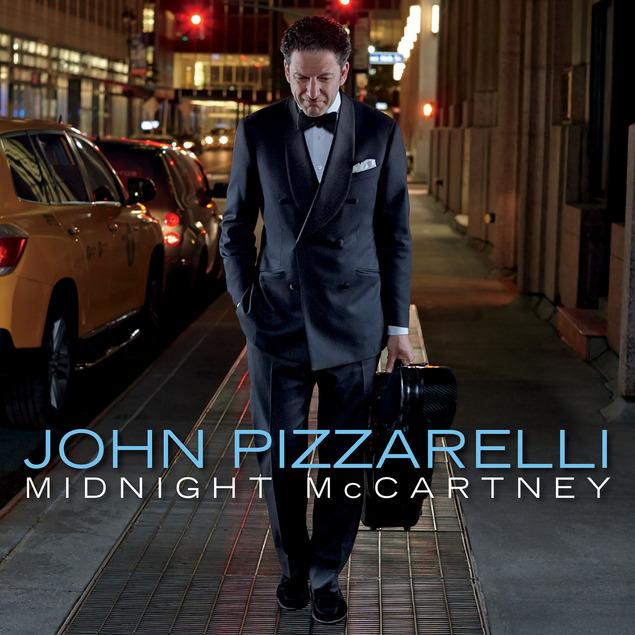 Pizzarelli’s latest album, Midnight McCartney, has its origins in McCartney’s GRAMMY®-winning 2012 album, Kisses on the Bottom. Pizzarelli played guitar on 10 of the album’s 14 tracks and backed Sir Paul at an iTunes concert at Capitol Records Studios, the GRAMMY® Awards and the Recording Academy’s annual MusiCares Person of the Year Gala. Fifteen months after those gigs, McCartney wrote to Pizzarelli to consider recording some of his lesser-known songs in a jazz style. In addition to being a bandleader and solo performer, John has been a special guest on recordings for major pop names such as James Taylor, Natalie Cole, Kristin Chenoweth, Tom Wopat, Rickie Lee Jones and the Dave Van Ronk, as well as leading jazz artists like Rosemary Clooney, Ruby Braff, Johnny Frigo, Buddy DeFranco, Harry Allen and, of course, Bucky Pizzarelli. A radio personality who got his start in the medium in 1984, Pizzarelli is co-host, alongside Jessica Molaskey, of Radio Deluxe with John Pizzarelli. Heard on more than 40 radio stations, the syndicated radio show brings warmth, humor and that long-lost “live” feel back to radio. The show takes place in their “deluxe living room high atop Lexington Avenue,” and the conversations are relaxed, candid and off-the-cuff as is the music. The show is also available globally as a podcast at www.johnpizzarelli.com and via iTunes. John has performed on the country’s most popular national television shows such as The Tonight Show with Jay Leno, Late Night with Jimmy Fallon, “Late Show with David Letterman, Conan, Live with Regis & Kelly, The Tony Danza Show and the Macy’s Thanksgiving Day Parade. In 1997, Pizzarelli made his Broadway debut in the musical Dream, a revue of Johnny Mercer songs. He led a 40-member live orchestra at Radio City Music Hall in Sinatra: His Voice, His World, His Way in 2003. His instructional DVD Exploring Jazz Guitar – filled with demonstrations, lessons and anecdotes – is available from Hal Leonard. Pizzarelli received the 2009 Ella Fitzgerald Award from the Montreal International Jazz Festival, joining a select group of past winners including Aretha Franklin, Tony Bennett and Harry Connick, Jr.
Pizzarelli performs annual engagements at the Café Carlyle with Jessica Molaskey and at Birdland with his jazz combo. He continues to tour throughout the United States, Europe, South America and Japan, performing classic pop, jazz and swing, while setting the standard for stylish modern jazz. Please visit www.johnpizzarelli.com for tour schedule, discography, radio guests and much more.